In 1967 the "Cold War" between the Soviet Bloc and Western Europe that started after the end of WW2 still existed. Germany was still a divided country and the city of Berlin still had four occupying forces, each controlling a "sector". The British, French and American sectors collectively formed West Berlin, and was in effect part of the Federal Republic of West Germany. It was totally surrounded by East Germany (the so-called "Democratic" Republic) and of course by the "Berlin Wall". The other sector, officially part of East Germany, was Russian controlled. Although all four forces had access in theory to every sector, it didn't quite work like that. Access between East and West was strictly controlled and only possible at one point, "Checkpoint Charlie". 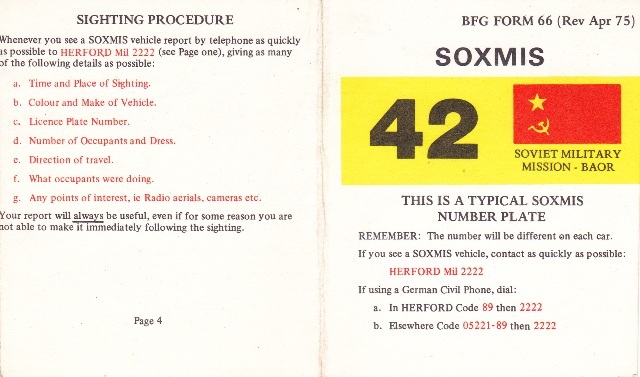 All British service personnel in Berlin, inclduding TA, were issued with a 'SOXMIS' card (see below left). SOXMIS was army-speak for Soviet Military Mission - the Russians. 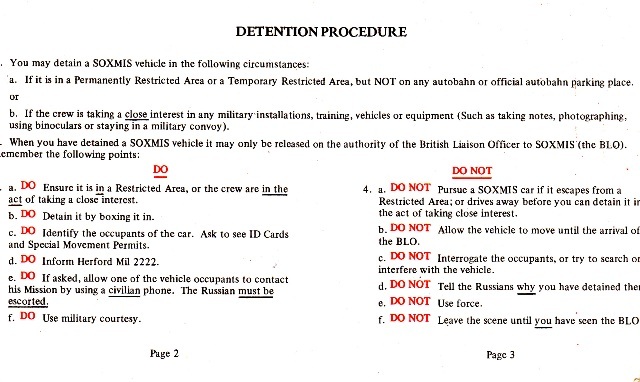 The card showed how to recognise a Soviet Military vehicle and gave instructions for reporting & detaining one if seen in the British zone. 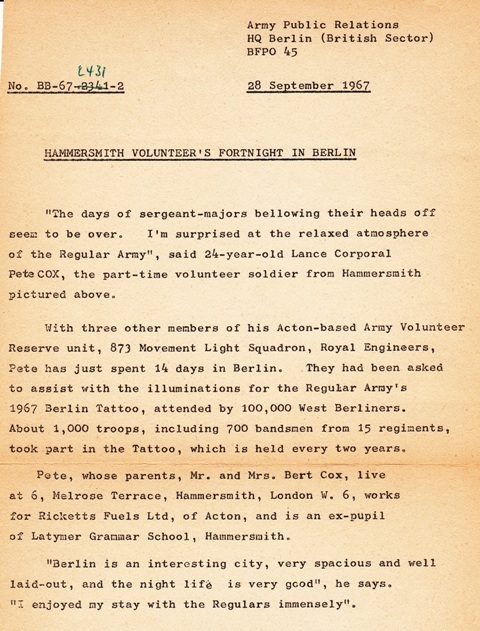 The British Army's Tattoo in Berlin was a biennial event. In 1967 a party of four (five?) from 873 led by S/Sgt Jack Woodroffe (right) was flown out to operate a couple of 90cm Carbon-Arc seachlights at the event. S/Sgt Jack Woodroffe outside Berlin Stadium, explaining the workings of carbon-arc searchlights to the Army's press photographer. 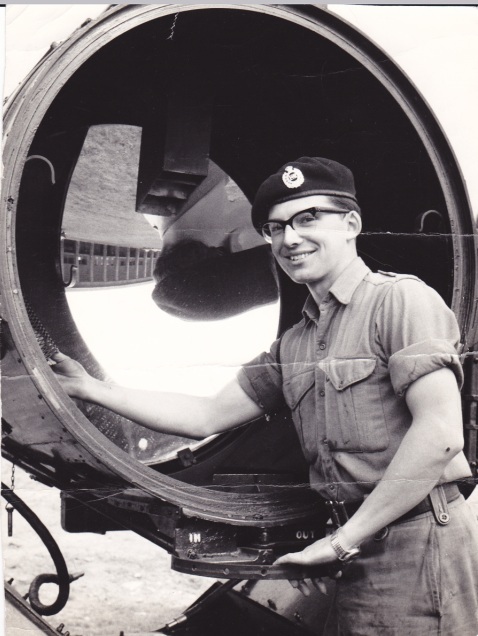 "I was very lucky to be chosen to go to Berlin - I had only been in the Squadron a few months and was not very experienced, particularly on the technical side. The lights had been in store in Berlin for some years, and they needed quite a lot of attention before they were mounted onto a couple of German-built MANN trucks operated by 38 (Berlin) Sqn RE, whose barracks (Smuts, next to Spandau Prison where Hess could be seen exercising) was our home for two weeks. It was held in the famous Olympic Stadium, where Hitler had addressed the masses in the 1930s, and where the Black American athlete Jessie James won 4 Olympic medals to Hitler's extreme annoyance. 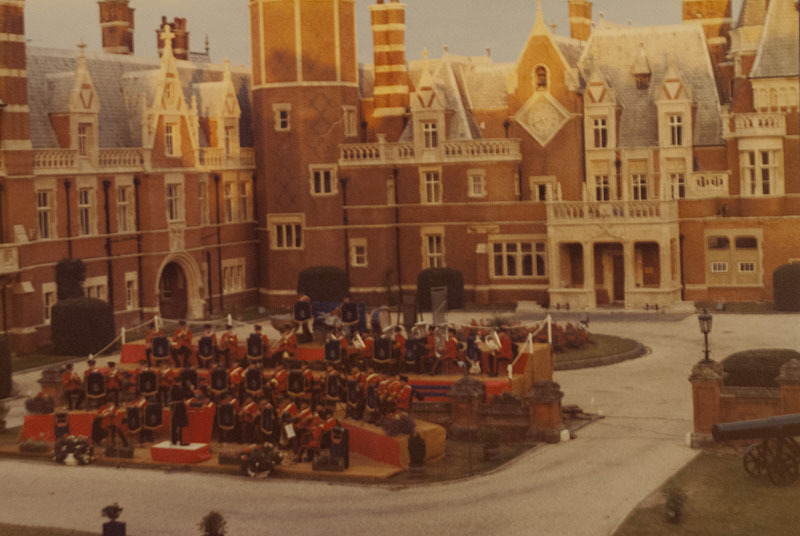 It was a huge pageant - I was told that it was the first time that 1,000 bandsmen had been assembled, but the letter I was given later [see right] quotes only 700. Which is still a mighty big band. We didn't operate inside the stadium. Our job was to shine the lights ack-ack fashion from the ground into the sky above. At one end of the stadium a huge scaffolding had been erected covered with hessian painted to represent the Moscow skyline. During the finale, the massed bands played the 1812 Overture, with a local church providing the bells, and the Horse Artillery, with their ancient gun carriages, the canon fire. Then the hessian was set alight and a firework display began. 90,000 Germans cheered while "Moscow" burned and British artillery filled the stadium with booms, smoke and smells. I was lucky enough to nip into the stadium to witness some of that. 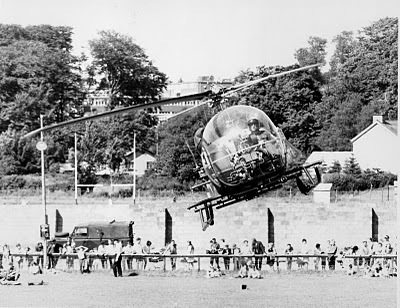 Then at the end of the show a huge Union Jack was unfurled below a helicopter high above the stadium - and four part-time TA Sappers from 873 in Acton lit it up with their WW2 searchlights. It was all very moving - and rather bizzarre. The tattoo was on our middle weekend, and after getting the lights back into store, we had nothing official to do, so had four days of sight-seeing. The highlight was a trip in uniform in an army mini-bus through Check-point Charlie into the Russian zone. The driver parked up somewhere and stayed in the vehicle while we walked all round East Berlin. We were followed everywhere by East German soldiers but weren't prevented from going anywhere. At one point we were at the Brandenburg Gate, looking to the West, when a party of Russian officers appeared about 70 yards away. I remember being told on our first day that we could ignore East German officers, but I could not remember the drill for Russian ones. If we saluted and shouldn't, we would be a laughing stock, if we didn't but should have, there would be an international incident. In the end we faced them, and I took my right arm up to my head, and scratched it. The Russians assumed it was a salute and saluted back." 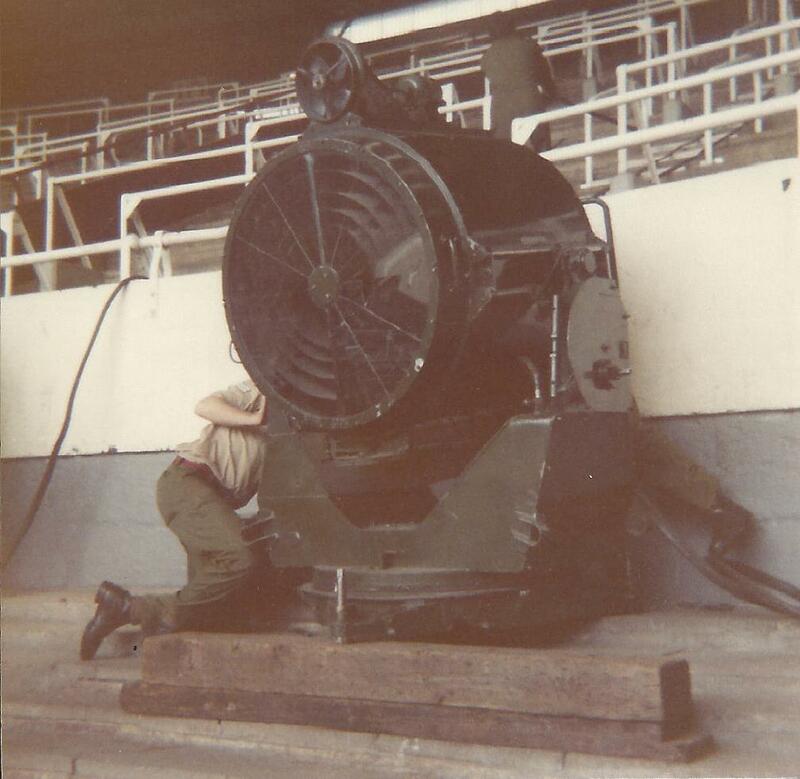 L/Cpl Peter Cox outside Berlin Stadium, pretending to do some maintenance work on an old carbon-arc searchlight as requested by the Army's press photographer. 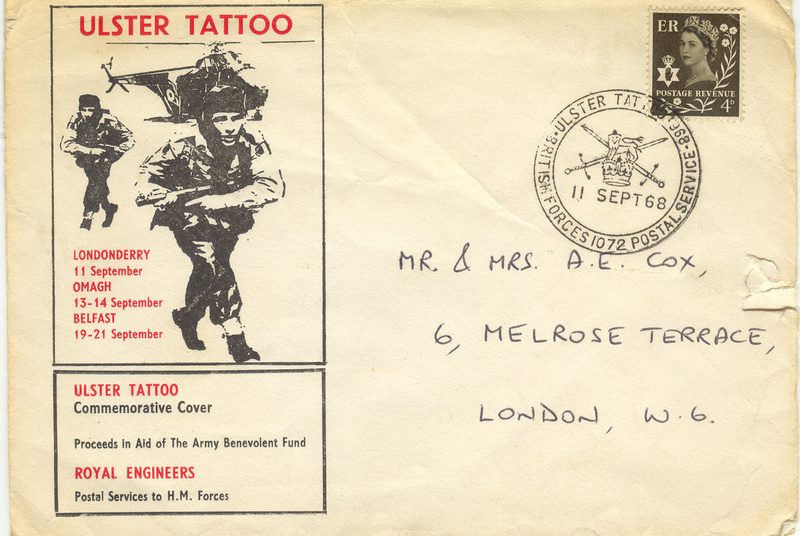 An Army press office letter. "My name is wrong (I've always been Peter) and the names of my father and school are wrong. And I don't remember making the quote, although I must say our hosts, 38 (Berlin) Sqn, officers and other ranks made us very welcome, treated us exceptionally well." 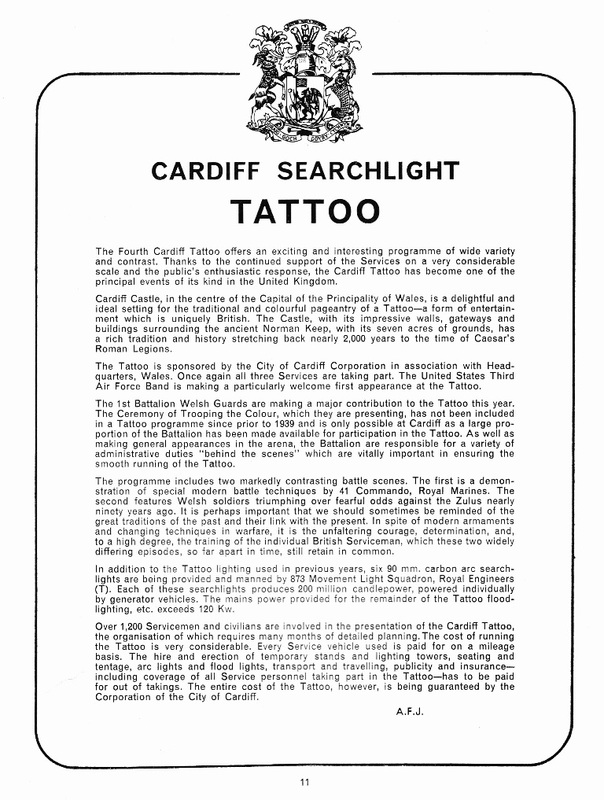 Held at Cardiff Castle during the period 873 were at Annnual Camp at RAF St. Athan, just 18 miles to the west, this was the 4th Cardiff Tattoo, and the first that 873 had taken part in, supplying six 90cm carbon-arc lights. Interesting to note that the cost of all military personnel and service vehicles (on a mileage basis) had to be paid for by the organisers out of income, and guaranteed by the sponsors, Cardiff City Council. Much more about the Tattoo later. 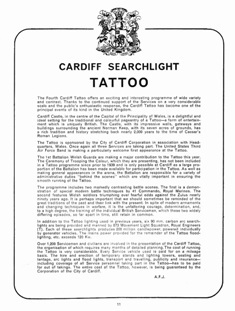 "The Cardiff Searchlight Tattoo an outstanding military spectacle of the time, held in Cardiff Castle – my father would build the scenery for mock battles on the side of Army Bedford trucks using a framework of scaffold poles, then wooden frames with hessian stretched over and the scenery painted on by council painters eg the farmhouse at waterloo, or the mission station at Rorke's Drift. 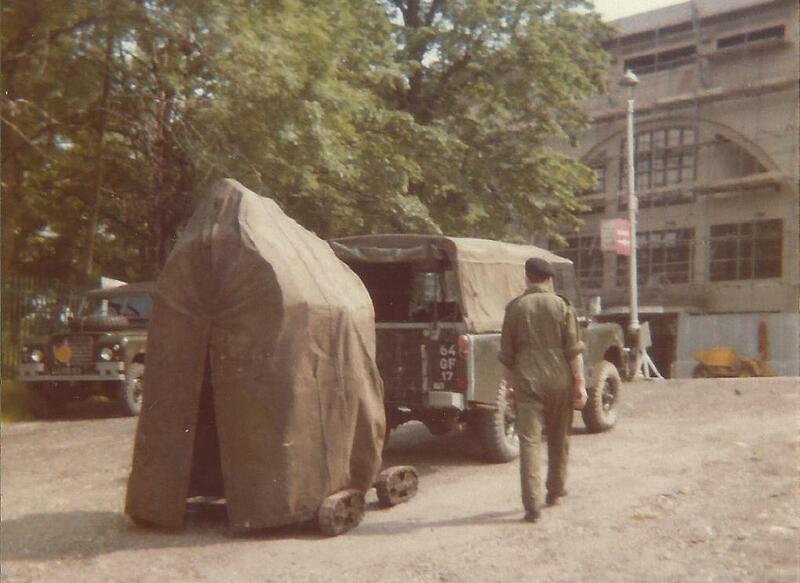 Whereas my role was building the portable ‘bogs’ and cleaning the ‘Elsan pans’ ! On a more serious note, beating the retreat and ‘Sunset’ remain embedded in my heart as a result of this job." 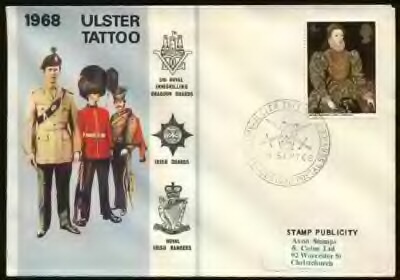 I cannot trace any previous searchlight tattoos in Northern Ireland, and there were no subsequent ones for at least 30 years, possibly much longer. This was a travelling show held at three locations with six performances in all; the first in Derry/Londonderry on 11th September; the next at Omagh on 13th & 14th; and three in Belfast on 19th, 20th & 21st September. Just two weeks later, on 5th October 1968, the RUC (police) attacked protesters at a Civil Rights march in Derry/Londonderry, sparking days of riots and marking what many consider the beginning of the "Troubles", twenty-eight years of violence by opposing paramilitaries. This is a Military Pageant designed for your entertainment. For you it need be no more unless you are of the younger generation anxious to investigate what a Service life has to offer. This Tattoo is a part of the day's work for the young men taking part and they are all proud to show you their professional skill as Technicians and Specialists in the Modern Army. In one way or another there are nearly 1,000 Officers and men involved in this Tattoo, many of whom you do not see in the Arena. There is the Administrative Team which accommodates, feeds and transports the performers, the Producer and his assistants who co-ordinate the Bands, the Parachutists, the Motor-Cyclists and the Military Police Team - all 'Stars' by right of their training and technique. It is the Teamwork and Training which do the trick! Any profits from this Show will be donated to the Army Benevolent Fund which looks after the old, disabled and the widows and children in the Army 'Familv'. Last year the Fund spent £621,000 in supporting Homes and Hospitals in grants to those in distress and in helping Army widows and children. In Ireland alone the Fund spent approximately £42,000. There is no charge for admission, so if you have a copper to spare put it in an Army Benevolent Fund collecting box! 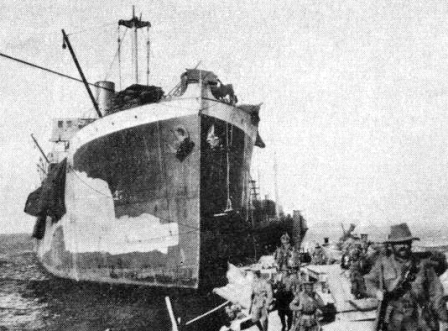 At Belfast on 19th, 20th and 21st September"
L/Cpl Peter Cox was lucky enough to be one of the "Specialists and Technicians" referred to in the flyer. He was one of a party of 14 from 873 who provided the sparkle - the lighting - at the six Tattoos. "Compared with the dangers facing some TA soldiers for months in the war in Afghanistan, two weeks in Ulster then would be like a picnic; but we found it exciting enough and the nearest most of us got to active service - In fact, taking part several years later in Northern Ireland training in Germany was actually much more 'challenging'. I can't remember where we stayed after that, but we seemed to do a lot of driving on the M1 to and from Dungannon." The tattoos at Omagh were at the 'Showgrounds', now a retail park. The helicopter display above was by the Royal Dragoon Guards; other items incl free fall parachute descent by the Red Devills (a Para Regt display team). Twelve TA other-ranks, plus the Sqn's two full-timers, Capt Cooper (Admin Off) and the PSI, made up the team for Ulster. For most (probably all) this was an additional fortnight to the usual 2 weeks Annual Camp. At one location, probably Omagh, 873 erected the scaffold towers for the lights themselves (normally they are built by specialists). On the first couple of attempts the scaffolding collapsed before it was finished. Front, L to R: Mick Byrne, ? 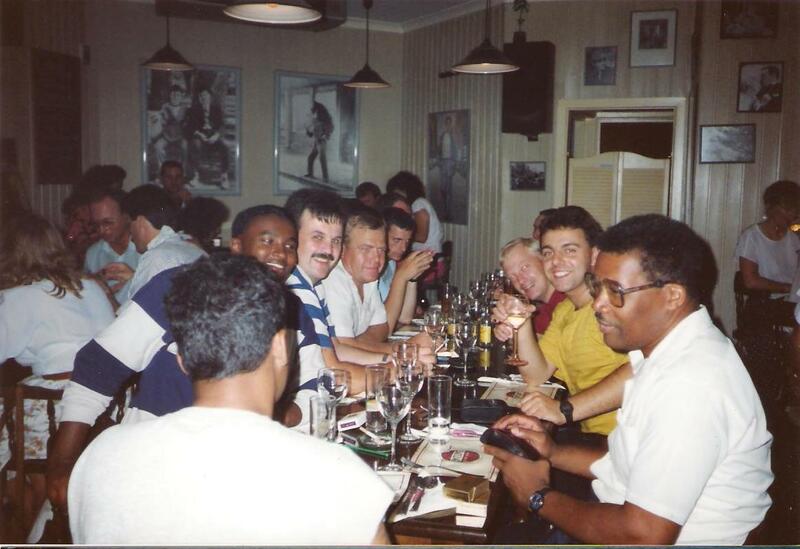 , L/Cpl Peter Cox, WO2 Lockerbie-Hayden (the PSI), Capt R.J.Cooper, L/Cpl Ted Allen, Spr "Jan" Janicki, Spr Hunt . At rear, in front of light, Spr Dennis Barr; on his right is Spr "Nobby" (Maurice) Clarke, on his left is Spr Stephen Kearney. Why wasn't Jan in working dress like the others ? 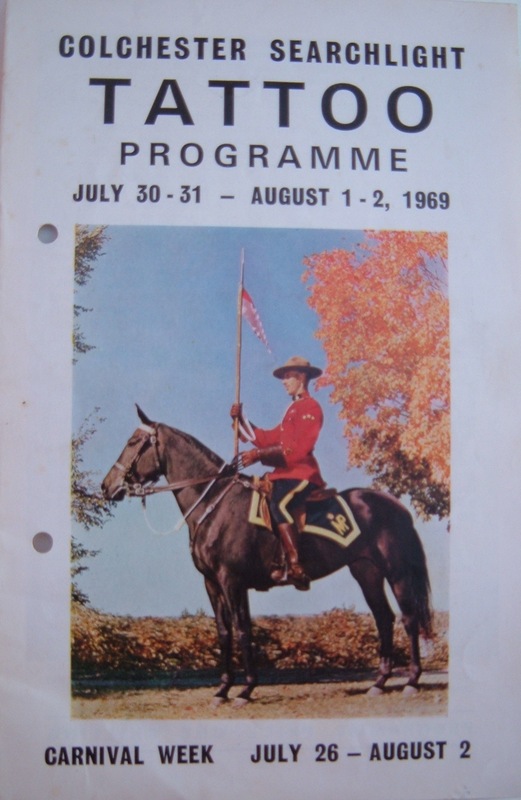 A colourful first-day cover found recently on the internet. 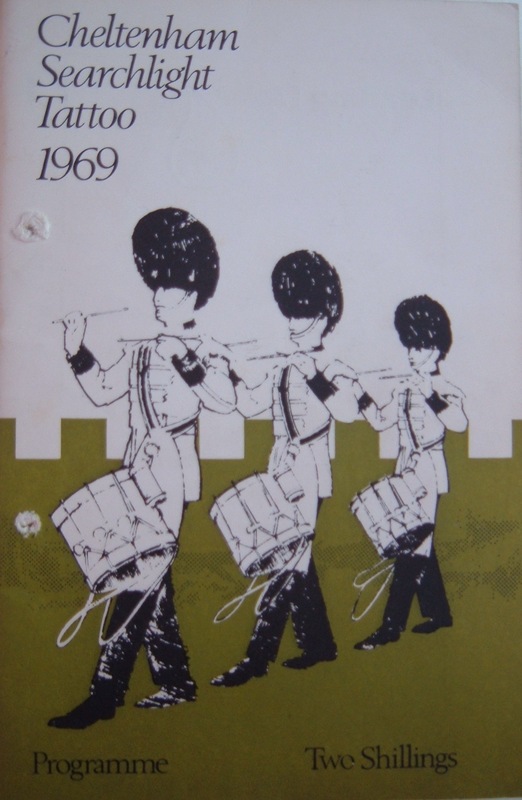 The rather boring first-day cover given to 873's men at the time. 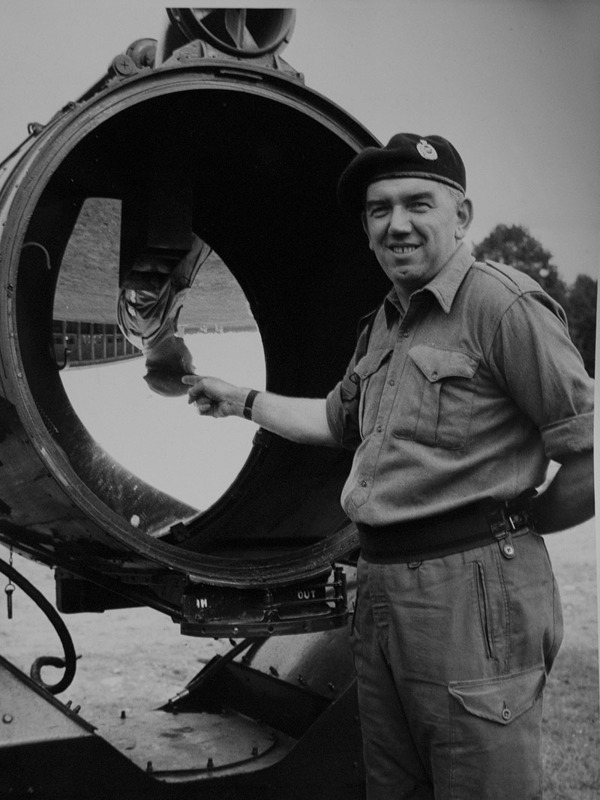 Ed Woodroffe, son of WO2 Jack Woodroffe, recalls that during the troubles in July 1969 there was discussions about 873 personnel and lights being deployed on "active service" in Ulster. 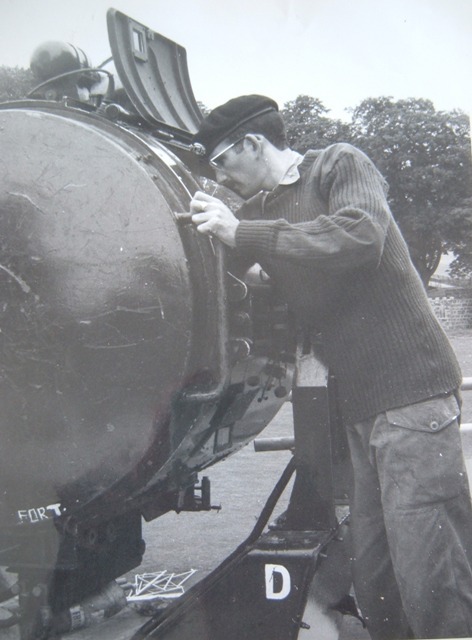 See "Searchlights in Ulster"
adjusting a 90cm carbon arc. 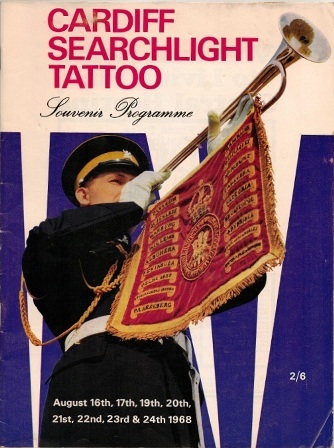 873 provided searchlight illumination at this tattoo while on annual camp at Penhale. "I am writing to thank you most sincerely for the tremendouse assistance you gave us with the Wessex Searchlight Tattoo. It was a great success in spite of the appaling weather conditions. About 1800 people saw it and letters of appreciation are already flooding in. I am very much aware of how much we owe to your Squadron, for without you there would have been no searchlight tattoo. I think your team worked magnificently under very difficult conditions, and on behalf of everyone connected with the tattoo I would like thank you all for carrying out such a difficult task extremely well. In addition I would like to thank you for all the additional tasks you helped us in, such as laying and taking up track 30, getting caravans (or nearly) into high places, assisting us with transport, etc, all of which helped enormously. Thank you once again for your valuable help without which the tattoo could not have been the success it was. I am extremely pleased to have been able to say farewell to the West Country in such a memorable way"
" Now that your summer camp is at an end and you have left us for London and your normal civilian jobs, I would like to offer you and your sqadron my most sincere thanks for the immense help you have given the tatoo. I am quite sure we established an ideal mix of Territorial and Regular experience and expertise. It was indeed a very happy and fortunate day we heard that it would be possible for you to light our tattoo as it would coincide with your 1974 camp. Thank you so much for bearing with the idisyncracies of an amateur Infantry Committee. There is no doubt that the searchlight tattoo was a great success despite the wretched weather conditions. It was marvelous the way your Squadron coped with the intricate lighting required for both the Cavalcade and the Finale. Both could have been a total failure without the correct lighting. The Squadrons performance on Saturday night was a tribute to a fine Territorial Officer (Captain Robshaw) and was also a wonderful display by a fine Territorial Unit. 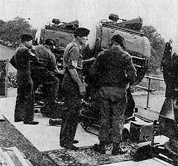 Well done indeed 873 Movement Light Squadron - How about a show in Brunei in 1976 - I can promise you there will not be a River Clyde to build"
Spr Bob Richardson, a driver/wireless op and searchlight op at the time recalls that the River Clyde referred to above was a prop used during the Cavalcade finale representing the front end of the 'SS River Clyde' which was used as a 'trojan horse' during the Gallipolli Campaign [1915-16]. 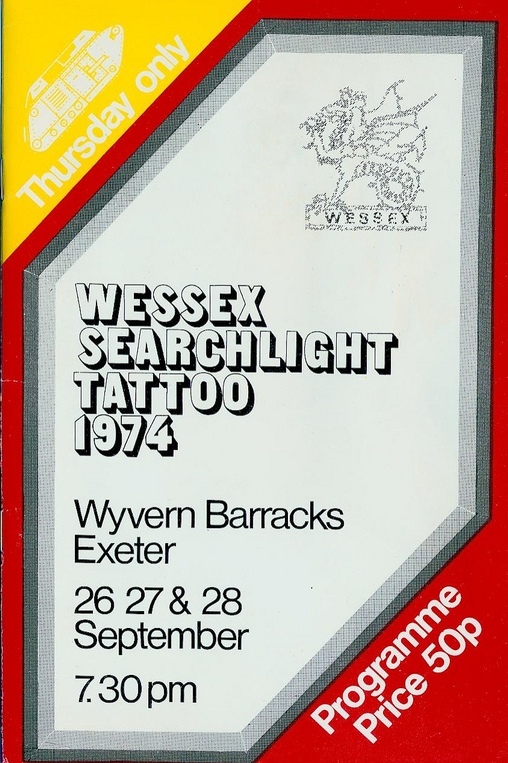 Also that the tattoo marked the closing of the Wessex Depot at Wyvern Barracks (the barracks became a pay & records office). Died at Wyvern Barracks, Exeter, on the last day of the Tattoo, aged 38. 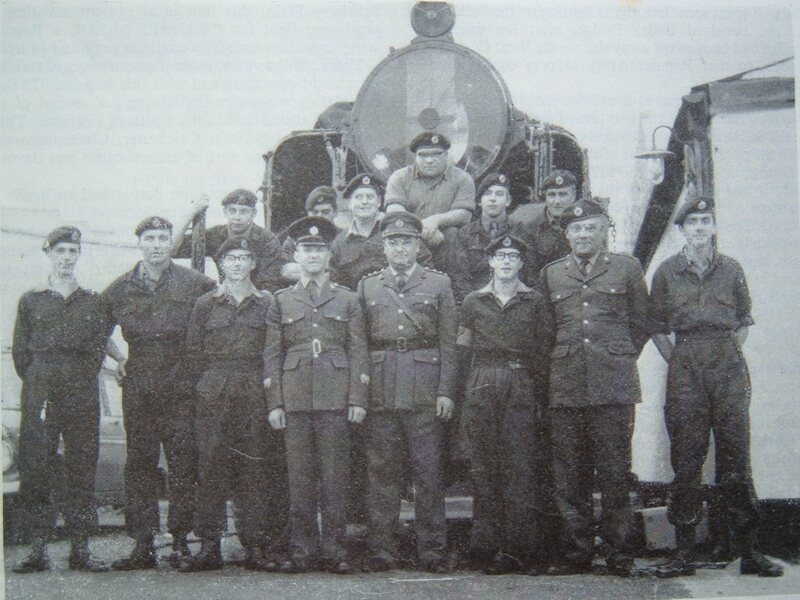 He was serving with, or attached to, 873 at the Sqn's Annual Camp at Penhale. 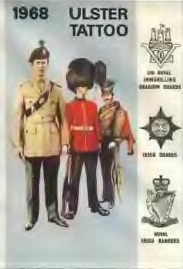 Commissioned as 2nd Lt in 1956 during National Service and promoted Captain in 1964. Following the reduction of reserve units in 1967 he was put on the unattached list. He married in 1967, and left a wife aged 29, and a daughter of 11 months. 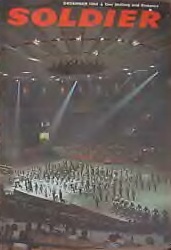 In 1976, 873 Movement Light Squadron appeared for the first time, sending 10 men (the first TA soldiers to take part in the Tournament) and four 90cm carbon-arc lights to shine on an enormous Union Jack unfurled from the roof during the show's finale which "depicted the progression of warfare from the stalemate of the trenches until the birth of the Royal Air Force during WW1", according to a report in the [Harrow ?] Gazette and Post in July 1976. The article also quoted Captain Ian Proud saying "We think it a great honour to take part, and had far to many volunteers to do the job and had to sort out who could attend each days two performances"
(Thanks to Spr David Samuels, one of the lucky ten, who posted the press cutting and photos on Flikr). 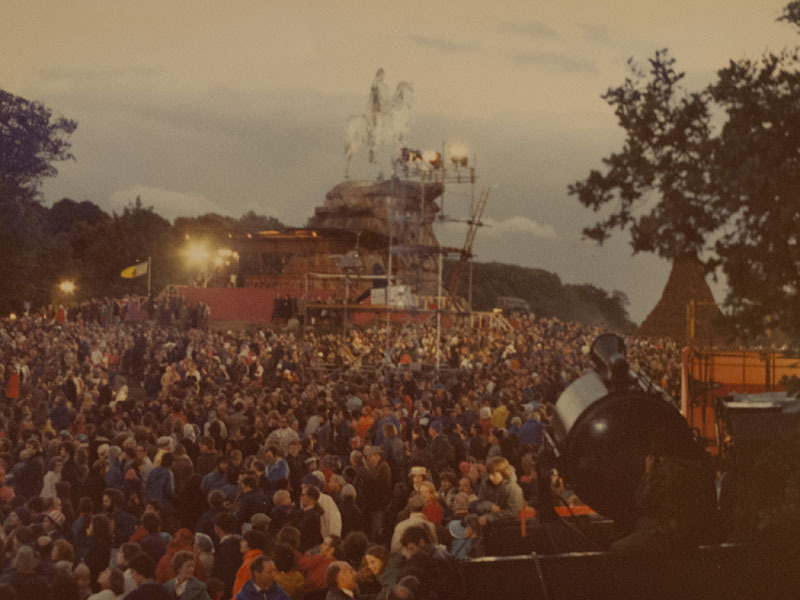 During the Queen's Silver Jubilee celebrations in 1977, a beacon was lit in Windsor Great Park on Monday 6th June at a statue known as the 'Copper Horse'. The beacon was the first of a series to be lit around the country and it was some hours later when the last was lit somewhere in Scotland. The event in Windsor was accompanied by a fireworks display, and lighting provided by old carbon-arc searchlights from 873. Photo by WO2 Jack Woodroffe, courtesy of Ed Woodroffe. 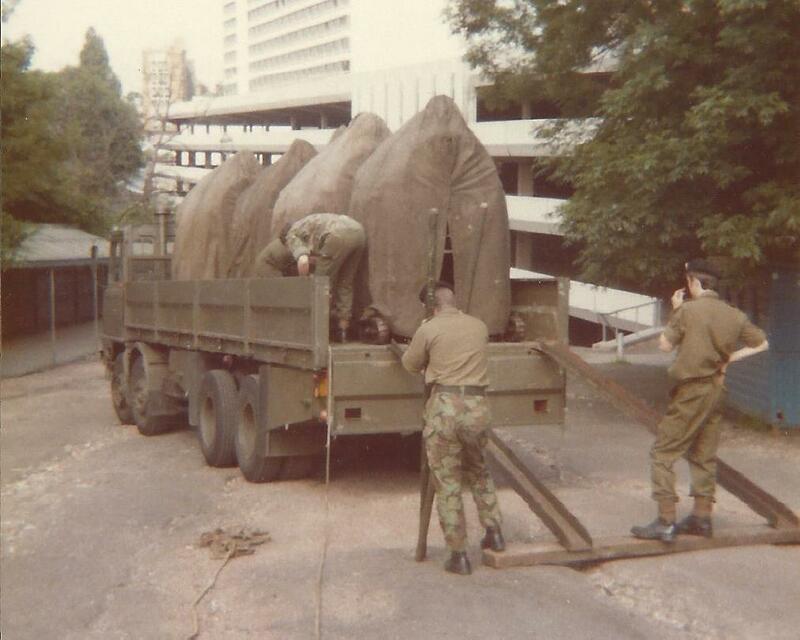 "I arrived on the first day of setting up with Dad [WO2 Jack Woodroffe]and at least four [Bedford] RL trucks, lights and generators were queued up on the main path into the Deer Park awaiting instructions for deployment having driven in through Rangers Gate. There were at least two on each side of the monument from the front of the statue and the photo was taken by Dad from the back of an RL sitting on the edge of the tilt [canvas top cover]. There may have been fifth and sixth lights behind the monument as I am sure that two lights came in from the Englefield Green gate but there were definitely four in front of the Copper Horse, two on each side (the other two not in the photo being to the left from where we are looking and placed either side of the Guinness Tent). Dad had a deployment plan which I saw and I am sure that there were probably six lights in total. I was with the light you can see in the photo. Sir Edmond Hilary and Sherpa Tensing were HM’s guests of honour and halfway through the evening a drunken man climbed up on top of the Copper Horse and had to be brought down by Police. Guinness were supplying the beer tent and Dad kept me well supplied during the evening wonderful chap he is!" "An amusing moment was when the high-tech lighting device had not actually reached the beacon, yet the flames leapt into the air nonetheless. Apparently the ACTUAL lighting device was triggered by a hidden operator who misread his queue [sic], lighting the beacon several seconds before the Queen had completed the ceremonial lighting! The Queen was delighted apparently, enjoying the glitch!" Minley Manor is a Grade 2 listed country manor house built in the French style in the 1860s. 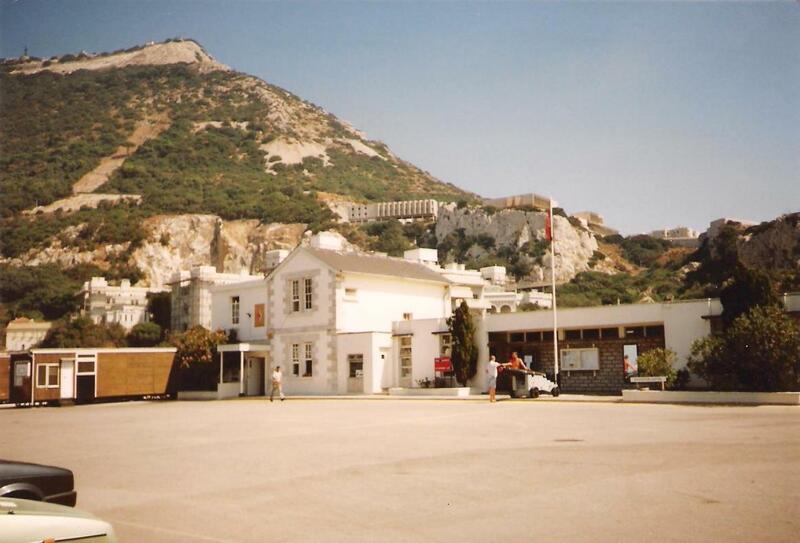 The war Department aquired the house and extensive grounds in the 1930s as an annexe to The Staff College at Sandhurst, and from 1971 it was the Officers' Mess for the Royal School of Military Engineering at Gibraltar Barracks on the other side side of the A327. The house has often featured in films and TV series. In 1969 it was used in the film Mosquito Squadron to represent a French château used during WW2 by the Germans as a POW camp and factory for production of V1 flying bombs. 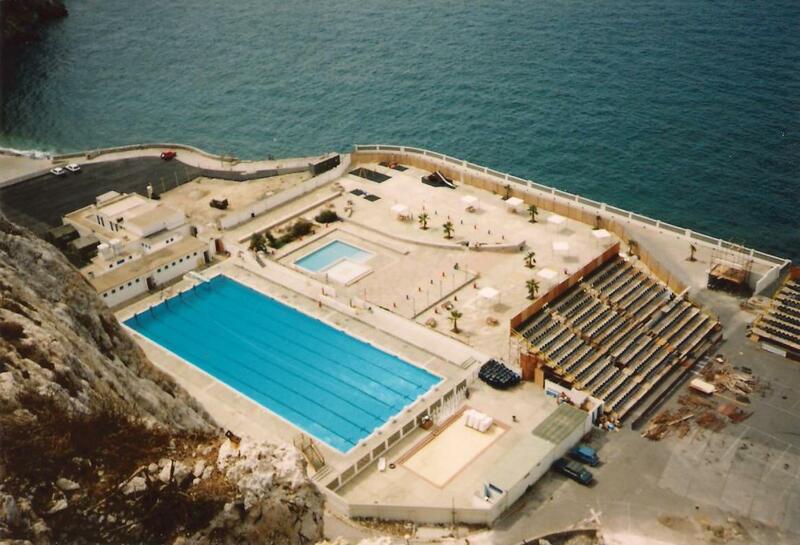 And in 1977 it was the setting for a spectacular event for which 873 provided ligting. Photo taken from searchlight tower. From Jack Woodroffe's collection, courtesy of Ed Woodroffe. Is this the RE Corps Band, was it Beating the Retreat, or part of the Queen's Jubillee celebrations? 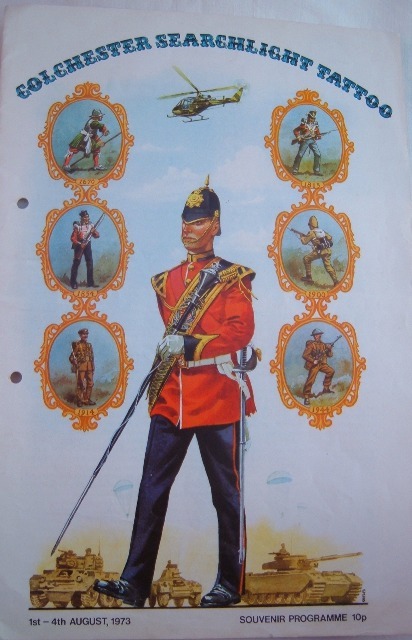 This extravaganza marked the centenary of the battle of Rokes/Roukes Drift in 1879 during the Anglo-Zulu war. 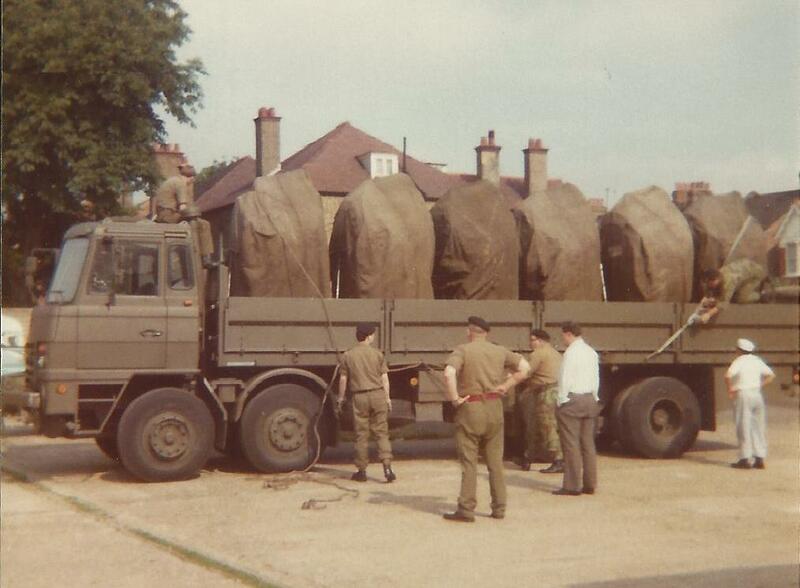 Six 90cm carbon arcs from 873 were used, travelling from Acton on the back of a Foden 10-tonner. Access into the stadium was difficult. L/Cpl Larry Hayward says the lights had to be towed by Land-Rover up a steep slope outside, then taken to bits and carried through the Stadium to their positions. 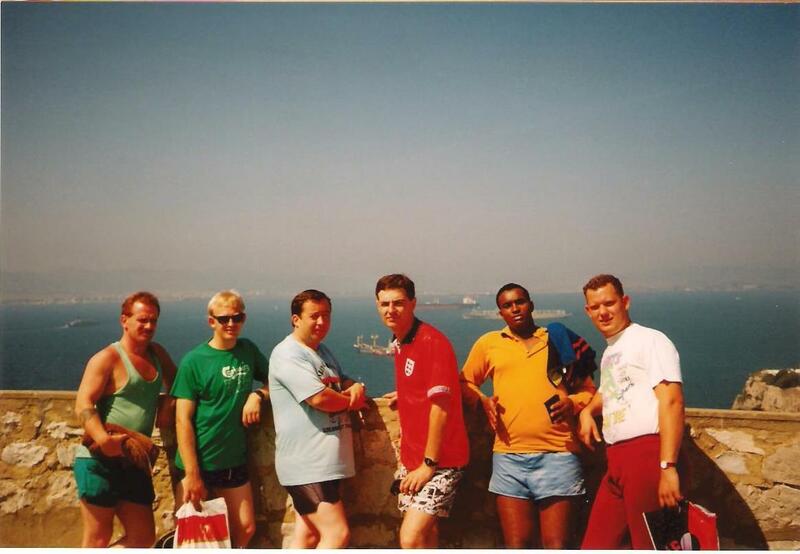 Photo top left, the three in the centre are Spr Jan Janicki, Spr Dennis Barr and Capt. Cooper. Is that the driver sitting on the cab while two others secure the load? And what is a cook doing there? Photo bottom right shows a light re-assembled but without undercarriage, and blocked up to level it on the stepped area. Larry also recalls that 873 "played football on the pitch during day time rehearsals, and all agreed to score a goal to say we had done so at Wembley". "When doing the lighting for a military band events on Horse Guards Parade in the 1980's we mounted our carbon arc searchlights on scaffold towers on three sides of the square in advance and then turn up for each perforance over a few nights. It was great fun having such a good view and seeing the Blues & Royals and Guards in action often in the presence of the Queen. The Lister generators were parked round the corner to keep the noise away from the crowd during the event. One night after going home we left one of the Lister Generators running and when one of the Squadron returned the next day it was still running! Once when I was working in Central London , I said to the lads I'll meet you up at Horse Guards rather than go all the way out to W3 and back. So I went to HG with my kit in my ruck sack and sat down on a Lister Generator right next to the rear of 10 Downing St. As I was in civys at the time a Policeman asked me what I was doing. I told him I was with 873 Mvt Light Sqn RE but he didn't like me being there so told me to move on. So I walked over to the gents toilet in St James and changed in to my uniform and then walked back to the Listers and started removing the covers and getting them ready, without interference, while the same Policeman looked on! " On Cup Final Day in May 1979 Captain Cooper arranged for a portable TV to be taken to Salisbury Plain so we could stop training and watch it! Otherwise we would not have attended that weekend! "One thing (or rather two) I'll never forget concern Capt Cooper. On more than one occasion when we were working down on Salisbury Plain, and had packed up ready for the drive back to Acton in the early hours, we were all treated to a fish and chip supper (obtained from some 'chippy' in the middle of nowhere) and a beer (from a barrel and pumps clamped on the tailgate of a LandRover). Still in the same general area, John ? (see my 19 Dec email) and I were driving back to Acton, and Capt Cooper (who was in his car) called a refreshment halt at the pub in Chitterne. It was a nice summer evening so we were in short-sleeve order. However, we'd been spotted by a couple of patrolling MPs who objected to our manner of dress as it was after 7pm or something daft like that. Capt Cooper told them - in his own initimable way - what they could do with their regulations, and nothing more was said or heard! He always looked after his men. I used all my annual leave (plus the 2 weeks paid special leave my employer granted me), most weekends, and as much as I could fit in during the week (mostly trips down to Salisbury Plain to provide light for the regulars) 'working'. In '69, I was living in a London Hostels Association hostel in South Kensington, and had to rely on lifts to get 'home' or at least part of the way, following the night-time adventures on the Plain. On one occasion, we didn't get back to Acton until about 2am and the lads I was with were all within walking distance of their homes, so I walked back to South Ken (near to the West London Air Terminal on Cromwell Road), with hob-nailed boots making a bit of a racket on the pavement. I got into bed just before 5am, and had to get up two hours later for 'proper' work, only to go down to the Plain that evening - but with a guaranteed lift back."